A new spot popped up in our neighborhood, and we watched and waited anxiously as it was constructed. There was a giant sign saying « Brasserie, coming soon ». I was scared it would be one of those chain brasserie restaurants like Hippopotamus. (I’ll have to tell you about my one and only Hippopotamus experience some day). Thankfully, it turned out to be a chic Parisian restaurant with an amaaaaaazing terrace to boot! 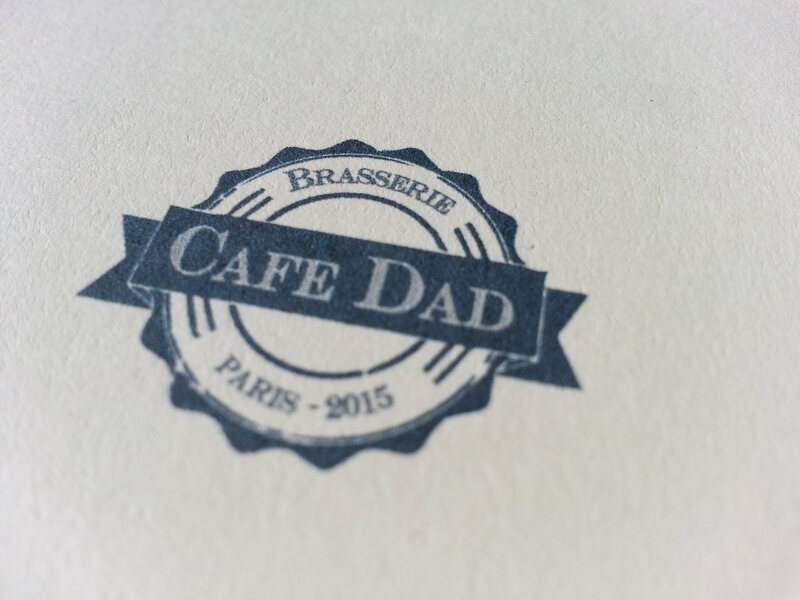 The trio that owns ad runs Café Dad is a team of two brothers and a friend of theirs. They are experienced Parisian restaurant owners who have previously owned an establishment over in the center of town (the 6th), Le Nesle. But they scoped out this new spot well before the building was even built! They knew it was going to be an incredible space for a popular Parisian café terrace. And believe me people, this terrace is full on every sunny day (of which we have had a lot so far this Spring). I have had coffee there several times and eaten there twice. The first time I ate there I had the lasagne which came with a very tasty little green salad, and the second time I ordered the cobb salad which was hearty and delicious with perfectly ripened avacado. Both meals were fantastic! I am also a fan of their desserts. And great news, all the food is made from scratch on site. Real cuisine, and not frozen food heated up. That is something that you can be happy about. A lot of restaurants are not so honest in Paris, and will charge an arm and a leg for food that has not been prepared according to French cuisine standards. But most of all I love the space. It’s chic, airy and spacious inside, with a large and sunny terrace, and even a large dinning area upstairs which would be great for a dinner with a group of friends. The three guys who work hard all day at their restaurant, wanted to create an establishment that rendered hommage to their grandfather,t hat they called « Dad », and have put details that he would have cherished all throughout the entire place, on the menu and in the spirit of their friendly service. Or grab breakfast to start the day off right, it’s only 5,50€! Also, they score major points for serving food all day long without interruption. And Happy Hour has cocktails at 6,50€. Nice!